Proverb: If you build a multiplayer only game, but few people play it, is it any fun? Pirates of the Caribbean Multiplayer seems to stand a good chance of being remembered as the mobile game that ruined things for a lot of other mobile developers. They seem to go on and on about how it is impossible to implement head-to-head, realtime multiplayer in their racing game or action game thanks to network latency, but developer Floodgate somehow managed to implement 16 player realtime online multiplayer, without so much as flinching, it seems. I'm not sure I'll be able to accept multiplayer-less titles in certain genres, anymore. 16 players is a number that isn't always super-easy for console developers to achieve, let alone a mobile release. More importantly, there's a solid, enjoyable game hiding behind the technical achievement. After choosing your ship, (which range from the speedy but weak Sloop to the hulking Galleon), and your game type (more on them in a bit), you're thrown right into the action. The game's matchmaking will try to match those searching for matches with games already populated, so (in theory) you're into a match trading broadsides as quickly as possible. The ship-to-ship combat isn't overly complex - movement is handheld with the directional arrows, and is relative to your ship. Meaning "left" doesn't necessarily move your ship to the left of the screen - it turns the ship to the left, regardless of which direction it's currently facing. The center button fires your cannons, with a target selected automatically. Simple. The auto-targeting works well - it's a popular feature in mobile games, as the medium strives to be as accessible as possible. Some games get it right, while others stumble. 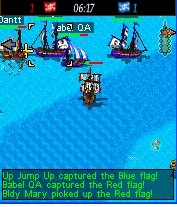 In Pirates Multi it was very rare that an enemy ship or fort was targeted, when I was trying to attack something else. Rounding out the controls are numpad hotkeys for various chat options, a level map, and the current score. The game's three modes are Broadside Brawl, which is essentially team deathmatch, Jolly Rodger (Capture the Flag), and Plunder the Port, the most complex of the three. This mode tasks teams with defending (or attacking) a town - as the attacking team's cannons damage the town, treasure is made available for pillaging, which must then be returned back to the other side of the map. I counted an impressive 24 maps available, to boot. All the maps have a variety of respawning speed & firepower power-ups littered about. This variety of levels and gametypes goes well above and beyond the call of duty, and does a lot to increase the longevity of the package. Also increasing the longevity are the persistent community elements laid on top of the main game itself. As you sink ships and win bouts you gain infamy, which corresponds to an overall level. As your pirate "levels up" he gains permanent stat bonuses like faster cannon reloading and faster ship speeds. Individual player and guild leaderboards add further incentive to come back to the world of PotC Multiplayer. In some ways Pirates Multiplayer's extreme online focus is almost a detriment. When I played several rounds with Floodgate employees (who were across the country) I experienced little lag, and had a great time working as part of a team to defend flags and ports, but I've never been able to get big rounds going with strangers - there just aren't enough people playing. There is literally no offline option, either. Right from the splash screen you're required to log in - so if you're out of your service area it's impossible to even check your pirates stats, let alone play an offline round. The Pirates license plays a marginal role in the experience, but does add a little personality. You'll recieve game tips on loading screens from illustrated versions of the film's characters, and certain map and item names are taken straight from the PotC mythos, but that's essentially it. If you're unwilling to purchase a game that's nearly unplayable off peak hours (when there aren't many others playing the game throws you into a map to sail around solo until others join), then Pirates of the Caribbean Multiplayer is, sadly, probably a pass. It still gets an overwhelmingly positive endorsement from us however, because during those few evening hours when the community is active, the experience is pretty hard to beat. Will the game mark the beginning of a mobile multiplayer revolution? I hope so. 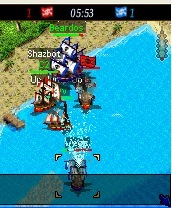 What's Hot: 16 player online ship-to-ship combat. Persistent community elements. What's Not: Simply not enough people playing. No offline functions. What Is The Jelly Phone? Touted as the world's smallest 4G smartphone, Unihertz's Jelly handset packs surprising power into a tiny form factor.